I’ve always thought of Loretta Lynn as an awesomely warm and caring aunt, much like Rosalind Russell in the film “Auntie Mame.” She’s been there and done that, has all the great stories to tell from her experiences, and is definitely a hip lady you want to listen to. Lynn changes speed from the secular to the spiritual with her version of “Away In A Manger” that sounds like it’s straight from the gospel church, reminding you the real reason for the season. 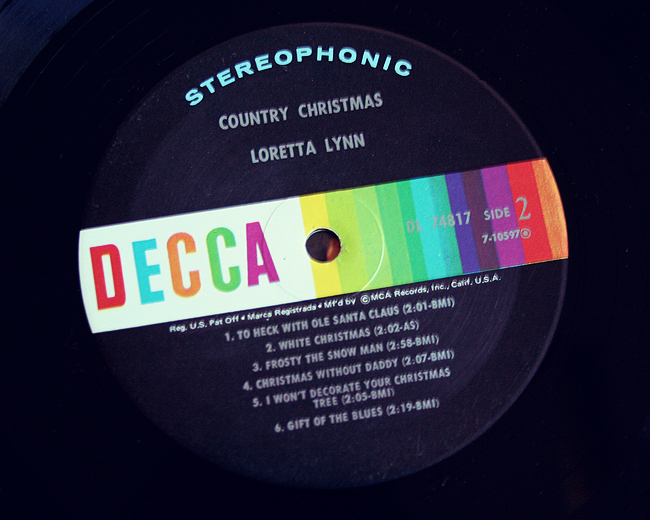 Of course, Lynn rocks out the traditional holiday favorites, as well, like “Santa Clause Is Coming To Town,” Irving Berlin’s “White Christmas” and “Silver Bells,” which steps out of the country for just a few minutes to enjoy ‘Christmastime in the city.’ And you can’t have a Christmas record without “Frosty The Snowman,” period. I again find Lynn’s sass and strong demeanor in her holiday originals the real treat of this holiday record, like the fun “To Heck With Ole Santa Clause” and “I Won’t Decorate Your Christmas Tree.” These songs constantly remind me of the wonderful disfunction that comes along with spending the holidays with close and extended family (queue National Lampoon’s “Christmas Vacation.”) Though I enjoy the sharpness of those songs, it’s also not a country record without some sad songs thrown in, too. 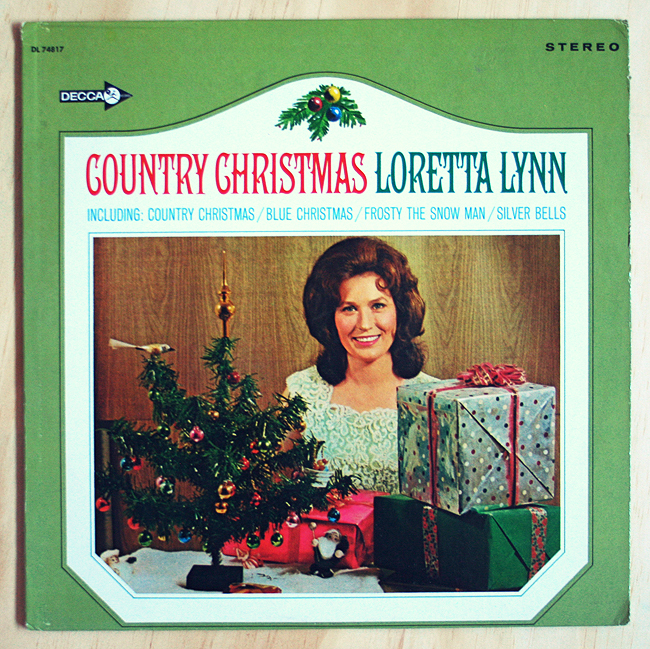 Lynn does a faithful job to “Blue Christmas” (still better than Elvis’ version) and covers Jackie Webb’s “Christmas Without Daddy” tear for tear. Lynn isn’t the only one who shines on this record. 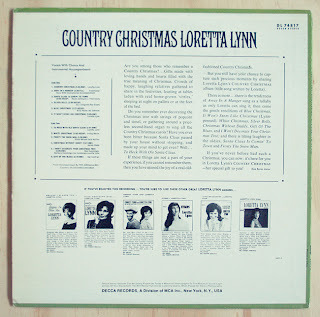 She is backed up by the legendary Jordinaires, making “Country Christmas” one of the best holiday records to find a permanent place on my turntable. 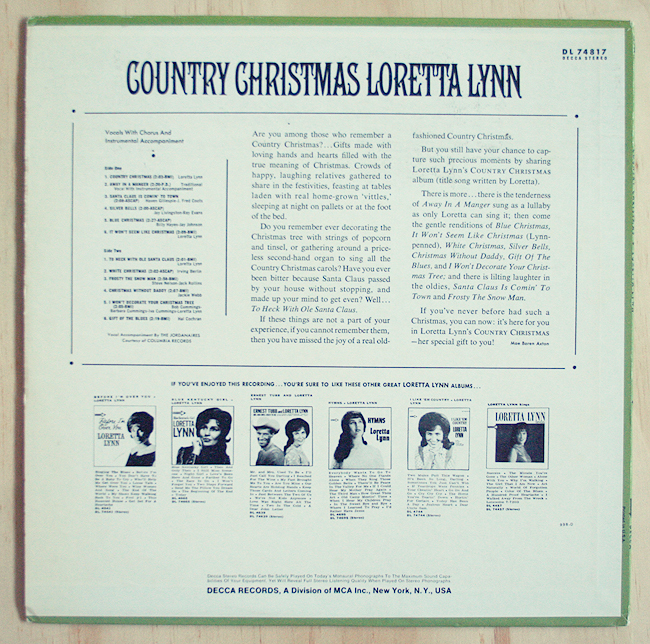 So, as you still have those Christmas cards to finish writing and addressing, perhaps some cookies and pies left to bake, even mentally preparing to spend a few days with the crazy relatives, take a trip to the country with Loretta Lynn this holiday season. It might be one of the best trips you’ve made all year. This entry was posted on Friday, December 16th, 2011 at 1:15 pm	and is filed under Music, Reviews. You can follow any responses to this entry through the RSS 2.0 feed. You can skip to the end and leave a response. Pinging is currently not allowed.